Favorite Pages devoted to Will Geer and The Waltons!!! Biography, Pictures, Frankfort- Indiana Mural, & What's New with The Waltons!!! Nostalgia Pictures and Stories from Frankfort, Indiana,�Will Geer's hometown. Indiana Historical Society - Will Geer Terrific biography of Will Geer and his days in Frankfort, Indiana! Will Geer Film & Television Credits Filmography from the 30's ~ 70's plus Notable TV guest appearances! Theatricum Botanicum Founded by Will Geer as a professional repertory theatre and Academy of the Classics for children and adults. Walton Mountain Museum Rediscover the era of the Waltons and enjoy replicas of the Walton rooms as seen on TV. The Waltons: The Unofficial Home Page A Wonderful place to see all the Waltons News! Biographies, Pictures, Cast List, Sounds and much more!!! have content dealing with the TV show The Waltons! plus an episode guide for each season! The Walton's Community Center Wonderful Walton's Site Directory! 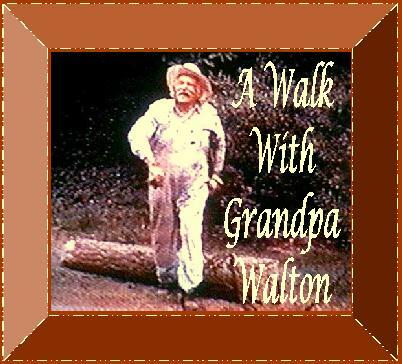 Visit The White Pages section to view Various home web pages involving The Waltons!!! Cynthia's Tribute to The Waltons A beautiful page dedicated to Ellen Corby ~ Grandma Walton. TV Tome - The Waltons Welcome to The Waltons guide at TV Tome. Thank You for your Wonderful Web-site on Html!